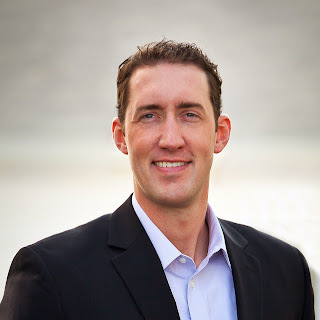 Editor's note: Today’s guest blogger is Derek Kruse, CIO of the Douglas Omaha Technology Commission (DOTComm), which provides municipal technical services to the City of Omaha and Douglas County, Nebraska. Be sure to join Innovation for the Nation, a virtual summit featuring government customers, streaming live on July 31st and August 1st. And see what other organizations that have gone Google have to say. The City of Omaha and Douglas County have something many municipalities lack, a collaborative relationship. With Omaha located within Douglas County, we are fortunate to live in a community that values working together to solve complex challenges. Our cooperation has led to many innovative solutions, including the formation of the Douglas Omaha Technology Commission (DOTComm). Another example of this collaborative spirit is our decision to upgrade our email and calendaring platform. In order to improve government productivity and efficiency, DOTComm has been tasked with moving approximately 5,000 city and county employees in more than 70 departments to Google Apps for Government. In May, after a thorough and exhaustive evaluation process, the DOT.Comm Oversight Committee approved the proposal to implement Google Apps for Government. The decision was endorsed by the Mayor and also unanimously approved by both the City Council and the County Board of Commissioners. We decided to go with Google Apps because it not only meets our current needs, but it offers new collaboration features at a fraction of the cost it would take to upgrade our existing system. We chose SADA Systems, a Google Apps Premier Enterprise Reseller, to help with this transition and serve as our deployment partner. It is obvious that SADA’s focus on training and ensuring a smooth migration will enable us to quickly and easily adopt Google Apps. 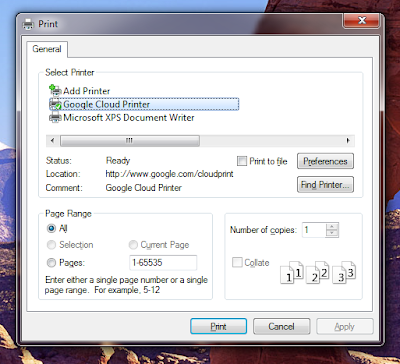 Moving to Google Apps will provide tremendous benefits. Our current system is more than 10 years old and lacks any modern features. Employees struggle to access information on their mobile devices and people spend valuable time deleting emails because our mailboxes do not have enough space. Given the age of our system, we have seen a steep increase in outages as well. That will all change when we move to Google Apps for Government. We will offer a more secure, stable, modern and scalable cloud solution to the City and County. Employees will now be able to communicate instantly and work collaboratively online, even if they are miles apart. Mailbox size alone has people cheering -- one of our employees made the comparison that we will be moving from a shot glass to a swimming pool! We started out this process to fix our aged email system. We have discovered this is much more than a fix -- this is the future -- and another big step in the ongoing collaboration between Omaha and Douglas County. The next few months will be very exciting as we implement Google Apps and we are very thrilled to be rolling up our sleeves once again to improve our community together. Editor's note: Today’s guest blogger is Gary Bateman, CIO for the Iowa Workforce Development. Be sure to join Innovation for the Nation, a virtual summit featuring government customers, streaming live on July 31st and August 1st. And see what other organizations that have gone Google have to say. In Iowa, our mission at Iowa Workforce Development (IWD) is to provide a comprehensive statewide system of employment services, education and regulations to ensure the economic security of Iowa’s workers, businesses and communities. An important part of our effort is to identify and prevent unemployment insurance fraud. Our efforts have cut the rate of fraud to less than 6%, but we are not satisfied to stop there. Detecting and preventing unemployment insurance fraud is challenging because of the high volume of claims we receive. Often times, we’re not able to detect the discrepancy until after multiple payments have been made. This lag means the bad actors can take the money and move on, making it difficult and expensive to recover the payment. We went looking for technologies to provide an even better rate of fraud detection, allowing us to act faster to prevent this criminal activity and save the state money. After a competitive bid process, we selected Fraud Detection as a Service (FDaaS) by Pondera Solutions, a Google Enterprise Partner, to help us identify and prevent improper payments. FDaaS is a Google-powered solution that uses Google Prediction API, Google Maps, Google Street View and Google Earth. With FDaaS, suspicious claims are proactively flagged by the system, which alerts IWD employees about potentially fraudulent claims. The claims are plotted on a heatmap built on Google Maps to identify areas with the highest fraud incidents and determine where to put more investigative resources. We also use Google Street View to check the validity of businesses that submit claims. All of these data points are compiled into a custom, configured dashboard that helps us quickly examine claimants and employers to validate whether these claims are valid. This dashboard will replace many of our manual processes of checking disparate databases. And because Google helps to integrate relevant market data into our validation processes, we can parse massive amounts of data quickly and efficiently, allowing us to identify advanced schemes and rapidly respond to potential issues. With all this information available at our fingertips, we can then examine claimants and employers to validate whether these claims are proper much more efficiently. Using the new solution, IWD will improve accuracies in Unemployment Insurance, benefiting both the employers and citizens of Iowa. Our continuing efforts will help assure that the vast majority of unemployment insurance benefits are delivered to the citizens who need and deserve our assistance. Editor's note: Our guest blogger this week is Tony Matheson, Manager Distribution Network IT Program for CitiPower and Powercor, electricity distributors whose core business is to deliver electricity to homes and businesses in Melbourne and throughout central and western Victoria. See what other organisations that have gone Google have to say. As an electricity distributor, our primary job is managing assets such as poles, wires, and other equipment with a focus on safety, reliability, and cost effectiveness for 1.1 million customers, 80,000 kilometers of power lines, and more than half a million power poles. Every fault or outage must be managed, corrected and restored as quickly as possible, and risks to community power supplies caused by major events such as floods and bushfires must be avoided or mitigated swiftly. With power distribution equipment spread across a wide area, we need to see the geographic locations of assets like poles, power transformers, switchgear, and so on, along with photos, maintenance, and planning information from our other enterprise systems. Yet we couldn’t overlay our data or put it into the context of an outage or other incident that might be happening in real time. The incumbent geographic information system requires specialised training to use and serves more specific functions. We needed something simple and effective to be able to overlay information from a variety of third-party sources including real-time emergency services information, as well as add further value and usefulness to data housed within our existing SAP Enterprise Asset Management software and Data Warehouse. After considering several options, we chose Google Earth Enterprise because it would offer powerful 3D visualisation technology that would be intuitive to use for everyone in the company, without training. We used the Google Earth API to customize our own view of the virtual globe to meet our exact business requirements. Our virtual globe is now housed onsite on a server behind our company firewall. Google Earth Enterprise allows us to create maps depending on the need, share them with others, and reach remote workers, so everyone has a consistent and familiar experience wherever they are. Google Earth Enterprise is so innovative and flexible that we can develop iteratively, with agility, and at a very low cost. We often can add a new layer to meet an immediate business need on the same day it is requested. 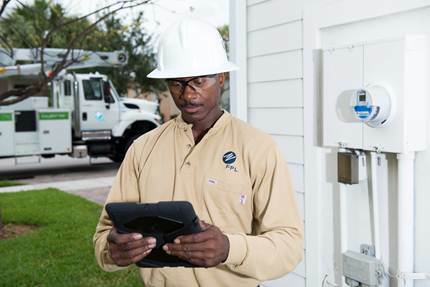 Today, we are delivering better, faster service to customers and driving business efficiencies. Situations can be analysed and acted upon with speed and accuracy. Google Earth Enterprise has helped us become far more innovative and agile. The investment required was low, and the benefits were immediate. Posted by Tony Matheson, Manager Distribution Network IT Program, Powercor Australia Ltd.
System Administrators’ responsibilities can’t be captured in a simple job description. They vary from company to company and even within organizations, but one thing is constant: systems administrators are the people who do what it takes to keep companies running. After more than 25 years in IT, I’ve worked with an incredibly talented and dedicated group of systems administrators and on this SysAdmin Day, I want to thank you for all that you do. Thank you for being the ones behind the scenes who make sure things “just work.” For coming in on holidays and in the middle of the night to do an upgrade or fix a server issue. For answering all of our questions, no matter how challenging or strange. For hours spent fixing the simplest email support issue to monitoring servers during a hurricane. I actually think that it’s what we don’t know about that deserves the most thanks. All too often, users don’t understand the amazing efforts that go into making things “just work”: physical plant, hardware, storage, networking, security, backup, disaster recovery, configuration, upgrades, patches... and it’s all only really successful if users only have to think about their own work. What we do in IT has evolved over the years, (hey, that’s a big part of why we’re here, right? ), but your role has only gotten more demanding. I’ve worked in technology since I was in high school; in my earliest days, the hardest problems might have been helping researchers convert their data from one tape format to another, which seemed equal parts engineering and magic. I remember another time, someone had a program that made a washing machine-sized disk drive vibrate across the machine room. It took us a while to figure that one out. And back then, before the Internet, a break-in meant the intruder was in one of our computing centers, and we’d have to send the most intimidating-looking system administrators to guard the door until the police came. I know the role has changed, and the challenges many of you face are much more complicated than they used to be. We thought the best way to say thanks would be to hear directly from you. Earlier this week we asked you to share some of the most far-fetched requests you’ve received from colleagues. The stories shared made us laugh, and reminded us how much hard work you do. If we don’t say it enough, thank you again for everything you do. Editor's note: Today’s guest blogger is TWS Partnership’s Chief Information Officer, George Garcia, who deployed Chromeboxes at Polaroid Fotobar stores. See what other organizations that have gone Google have to say. At the Polaroid Fotobar in Delray Beach, Florida, we help visitors create beautiful physical artwork from their digital pictures. 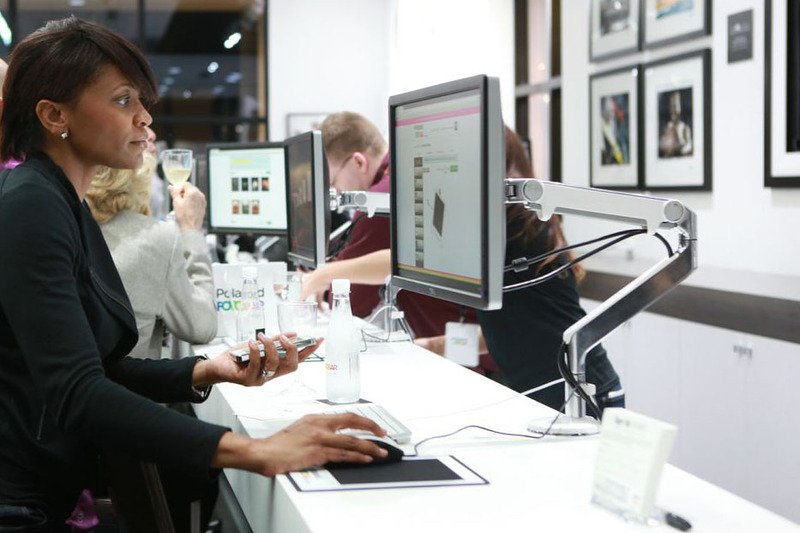 When customers visit the store, they can use our Chromebox kiosks and web-based photo editor to add effects and print their photos on lucite, metal, acrylic, bamboo, or other creative materials. We just opened our second store at Union Station in Washington, D.C., and are opening several other locations this year. For our photo kiosks, we wanted technology that delivers both a great customer experience and was simple to manage, so we could grow quickly. Customers like using Chromebox kiosks - they resume instantly, are lightning-fast at handling web apps and basically crash-free. Our business colleagues are happy because the Chromebox is a fraction of the cost of other options we considered. And, as the tech team that has to make everything work, we’re thrilled with how the Chromebox is performing. We’re using the managed public sessions feature, available in the Chrome Management Console, to create a custom Fotobar kiosk experience for customers, including setting a branded home screen, adding photo editing apps and photo sources, and blocking sites we don’t want customers visiting. The public sessions feature also wipes any customer data at the end of each browsing session, so each user is starting fresh. Since all the operating system updates are automatic and the devices have built-in virus protection, we can spend less time maintaining devices and more time on our expansion plans. We look forward to bringing the fun of our Polaroid Fotobar service to more people around the world soon. Editor's note: Today’s guest blogger is Kirk Suscella from Florida Power & Light. See what other organizations that have gone Google have to say. identify and fix problems as they arise. Google to help drive continued service improvements for the benefit of our customers. were reported, what caused them and when power is expected to be restored. who weathered the storm know when their power will be restored. Editor's note: Whether it's in the factory, warehouse or office, manufacturers need to work efficiently to bring their customers what's needed. This week we're focusing on how companies in the manufacturing industry are using Google technology to work better and stay connected. Today we'll hear from Mike Ellerton, Head of Service and Infrastructure at Premier Foods, the UK’s largest food manufacturer. Watch our manufacturing webinar and see what other organizations that have gone Google have to say. We’d been on Lotus Notes for more than 12 years and, as Premier Foods changed, it stopped fitting our needs. We evaluated Google Apps, IBM® SmartCloud and Microsoft® Office 365. We found the tools in Google Apps were familiar and enabled employees to easily work together. They also gave us the ability to seamlessly sync everything to mobile devices, a previous pain point. After a short pilot, we launched Google Apps to 4,500 users and enabled 1,000 company-owned Android devices in just two months. By switching to Google Apps from IBM Lotus Notes, we saved 50 percent on our email operating costs. In an investment heavy industry like manufacturing, any money that can be invested in revenue driving parts of the business like marketing and sales instead of on infrastructure like servers, is a huge benefit. Plus, as a company that has grown through acquisition, the ability to easily add or subtract users as needed allows us to scale our business with very little expense. By connecting people and information, Google Apps has helped us build a sense of community inside the company that wasn’t there before. 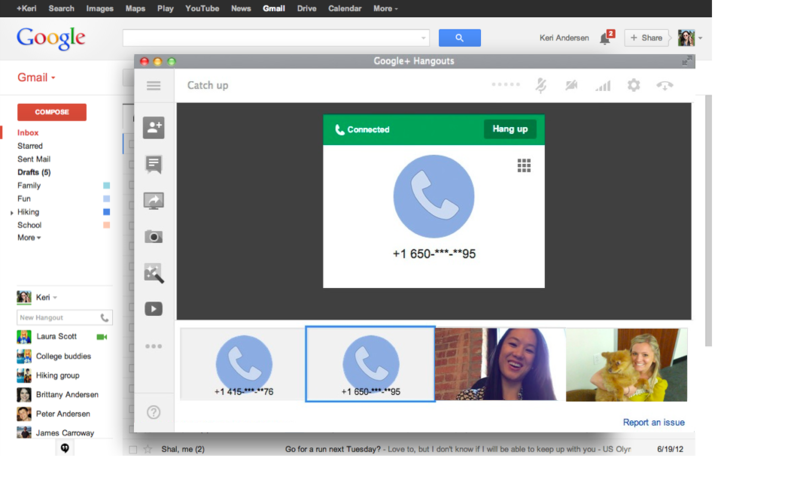 We’ve just started using Google+ Hangouts and they’ve already been fantastic for connecting employees across departments and locations. I personally have about 10 Hangouts a week which has cut down my travel dramatically as well as engaging and connecting the individuals that previously switched off during traditional voice conference calls. We’ve even created Hangout “kits” with webcams, headphones and “quiet” flags (to let fellow employees know you’re on a video conference), so people can grab a kit and try it for themselves. Staying fresh can be a challenge for big food manufacturers, but with the help of Google Apps, Premier Foods is able to do just that. It’s fun to hear people say, “Wow, Premier Foods does video calls? That’s pretty cool.” It validates our focus on using technology that helps us stay one step ahead. And this is just the beginning – as Google continues to innovate, we'll continue to grow with it. You’re changing the world. We want to help. A couple of weeks ago, we celebrated the winners of the Google Global Impact Challenge in the UK, awarding prizes to nonprofits for some amazing, innovative uses of technology to help their causes. Today we are thrilled to go one step further and launch the Google for Nonprofits programme in the UK, starting in England and Wales. 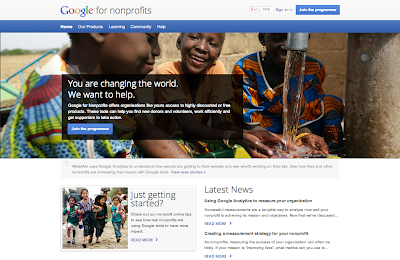 Google for Nonprofits is a one-stop-shop that offers access to our suite of free and discounted products and tools. If you work for a nonprofit, you can apply to join the program today. Once your organisation is approved, you get free Google Apps to cut IT costs and operate more efficiently, up to $10,000 a month in advertising on Google AdWords to reach more donors, and premium features for YouTube and our mapping technologies to raise awareness of your cause. We’ve also developed other online resources such as educational videos, case studies and better ways to connect with other nonprofits. Over the years, Google has donated over $1 billion worth of products to nonprofits, and several UK organisations are already using our tools. BeatBullying, a charity that fights online bullying, uses Google Apps to enable more sharing and collaboration amongst colleagues; the Royal National Lifeboat Institution uses Google AdWords and YouTube to raise awareness and recruit more supporters; and WaterAid uses Google mapping technologies to show where their work is making a difference. We’re inspired and humbled by the amazing ways nonprofits are making the world a better place, and look forward to supporting the work of more UK nonprofits. Editor's note: Whether it's in the factory, warehouse or office, manufacturers need to work efficiently to bring their customers what's needed. This week we're focusing on how companies in the manufacturing industry are using Google solutions to work better and stay connected. 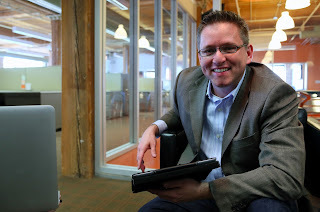 Today's guest blogger is Jim Nielsen, Manager of Enterprise Technology Architecture and Planning from Shaw Industries. Watch our manufacturing webinar and See what other organizations that have gone Google have to say. At Shaw Industries, we’re proud to have been a part of Northwest Georgia’s manufacturing heritage for over one hundred and sixty years. Many of our employees have worked with us for thirty or forty years, bringing with them a deep knowledge of the flooring industry, and a dedication to continuing our tradition of excellence. Though we started in Georgia (and are still based there), our real estate portfolio includes 80 manufacturing sites in seven U.S. states, Mexico and China. We also have 50 distribution centers, as well as 19 showrooms located around the world. We are, in every sense of the word, a global flooring manufacturer and staying connected through communication and collaboration is central to our business. 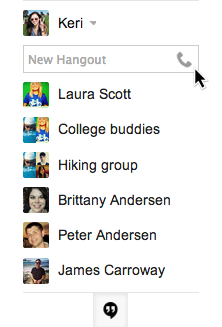 In 2012, we rolled out Google Apps to over 10,000 employees. In addition to the immediate benefits of email, calendar and contacts, tools like Google+ Hangouts and Google Drive helped us transform complex, manual, and slow processes into a fast-moving and efficient stream of information. Because these tools make it much easier for our employees to communicate and collaborate wherever they are, Google Apps has helped us “go lean” by eliminating wasteful processes and improving information flow. For example, our plant engineers can keep machines running more efficiently and safely by using Google Drive on any device to access and share our equipment manuals and safety procedures. The flow of information globally and locally has really improved, as well. The combination of Hangouts, Docs and Google Translate has helped our global teams communicate with plants and suppliers more easily while reducing meeting times by up to 50 percent. 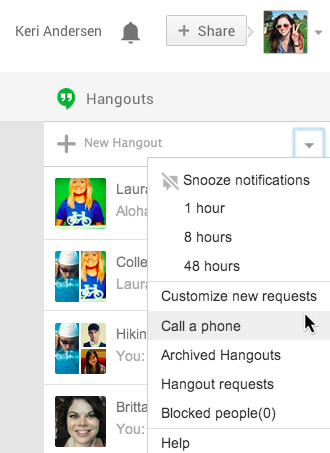 Even employees located only 20 minutes apart are choosing to meet over Hangouts, saving travel time and gas. Similarly, our marketing and sales teams also use Google Docs to work more efficiently with third-party agencies on print and broadcast ads, and our departmental finance teams have streamlined their budgeting processes with Google Sheets. Our associates at Shaw are passionate about their work, their products and our company. Their passion extends to tools like Google. It’s not often that a product is implemented and a year later co-workers are still mentioning what a good idea it was, and how they are still excited to be using it. Google has helped us strengthen this community by allowing us to work together, wherever we are, with whatever devices we’re using. We’re operating on a leaner, stronger foundation thanks in large part to Google. Editor's note: Whether it's in the factory, warehouse or office, manufacturers need to work efficiently to bring their customers what's needed. This week we're focusing on how companies in the manufacturing industry are using Google solutions to work better and stay connected. Manufacturing has always been shaped by technology, from the earliest days of the Industrial Revolution to the latest robotics on the factory floor. As advances in technology have taken shape, it’s become important for manufacturing companies to manage widespread teams of employees in all corners of the globe and work with vendors and suppliers to serve global customers. There is an added expectation that the industry also needs to keep everyone in sync and effectively and efficiently communicate, collaborate, schedule and track employee and customer activities. This week we will highlight how a handful of leaders in manufacturing use Google solutions to better focus on their business needs, allowing them to move faster, innovate and collaborate. By relying on new technology, manufacturers are discovering new ways to stay connected across locations, devices and systems. This week you’ll read specific examples from our customers: How one company used Google Apps to cut their meeting times in half; how another used Google Maps to track their best performing sales territory; and how one customer got real-time access to their Enterprise Resource Planning (ERP) by integrating Google Search Appliance. Ready to learn more? Check back daily to learn how companies are streamlining processes and “going lean” with Google. Editor's note: Our guest blogger is Jason Bullock, Infrastructure Director at BDP International, a global transportation company with operations in 115 cities throughout the world and a network of subsidiaries in 122 countries. See what other organizations that have gone Google have to say. Whether it’s moving a tractor to Jakarta, sending a blood pressure monitor to Milan or putting a beer in someone’s hand, at BDP International, we manage logistics for international transportation from start to finish. We run everything from documentation to shipping, making sure all the regulatory requirements are met along the way. We depend on technology to orchestrate the freight logistics and transportation globally on air, land, and sea, so we need to have an email system that’s dependable and tools that are collaborative. In the past, we used Microsoft Exchange. Maintaining the Exchange environment was costly, and without significant investment our reliability issues would’ve continued. We needed to be able to monitor the mobile devices that connect to our systems and better predict usage patterns. We considered upgrading our on-premise Exchange environment or moving to the cloud on either Microsoft Office 365 or Google Apps for Business. The Exchange upgrade was three to four times more expensive than both cloud options and, while Office 365 offered familiar features, the pricing was not within an acceptable cost structure at the time of our evaluation. Google Apps gave us a complete set of tools for a single per-user fee, with the highest reliability and security overall. In April of this year, Google Apps Reseller Cloud Sherpas helped us move our 3,600 employees over to Google Apps. Although we’ve only been on Apps for a few months, we are already seeing how Google Apps is helping our employees work better together. First, our compliance team is using a Google Site as an internal regulatory information hub, and our VP of Compliance uses the automatic translation feature in Gmail to communicate with our office in Mexico in seconds, without the hassle of finding a translator or leaving the original message. We moved an entire process around event planning from a paper form to a Google Form, which allows our event coordinator to collect and share all the details with the planning staff seamlessly and much faster than before. Finally, we’ve moved off of our company Blackberries onto Android and iOS smartphones with Google Apps. 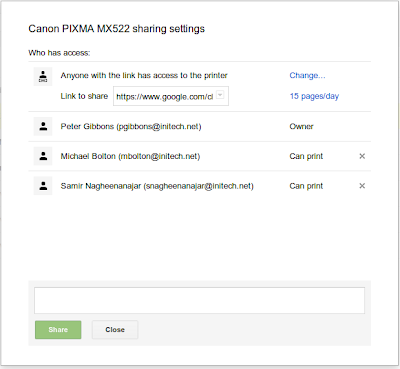 This allows our teams to work faster since everyone can edit and collaborate in Google Drive from anywhere, while giving our IT team better visibility into our network thanks to the mobile management console. Moving to Google Apps helps our employees view technology as a tool, not an obstacle, and is making us a more nimble company. We can get work done from anywhere while moving around as freely as our cargo. We had talked about making this happen at BDP for a long time, but Google Apps really helped us kickstart the change. 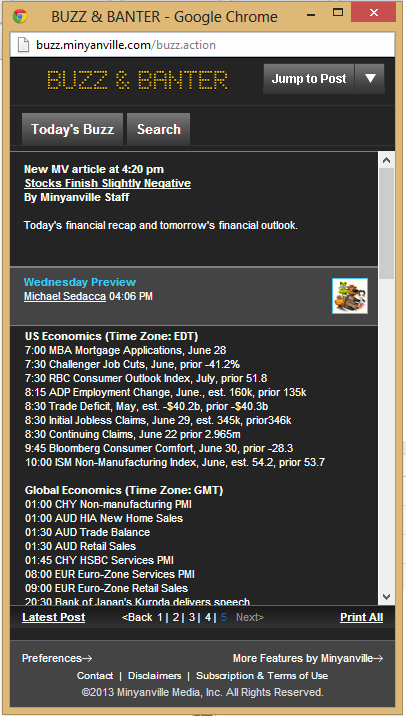 Editor's note: Today’s post is from Philip Talamas, CIO of Minyanville Media, Inc., a New York based financial media company. In this post, Philip looks at the benefits his company received from switching from a major public cloud provider to Google Cloud Platform. At Minyanville Media, our goal is to create branded business content that informs, entertains, and educates all generations about the worlds of business and finance. We designed our premium Buzz & Banter app app to serve this need. The Buzz ran on a competing cloud platform that presented increasing technical challenges as we expanded our customer base and feature set. We wanted a higher performing platform offering a more flexible and deeper feature set; we wanted to be certain we were serving our longtime clients as best as we could. We consulted our strategic technology partner MediaAgility, and the company advised us to move to Google Cloud Platform. There were two obvious benefits to switching to Google Cloud Platform from our old provider: better reliability and automatic demand-based scaling of the application. Every day, thousands of investors access our system globally, everywhere from Syracuse to Switzerland. They turn to us for reliable market intelligence and investing ideas. 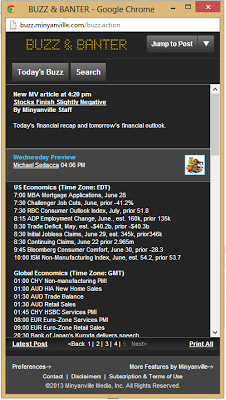 Today's economic uncertainty, coupled with high frequency trading, keeps us on our toes. When a central bank unexpectedly cuts interest rates or a hacked tweet sends markets into a tailspin, seconds matter. We are timely, or we are out of business. It’s as simple as that. Additionally, we serve two major online brokerage firms, which have very high standards for performance and reliability. Hence, we decided to move Buzz and Banter to the Google Cloud Platform. The improvement and increase in operational speed was drastic. New Buzz, running on Google App Engine, updates content instantaneously -- even before our content management system refreshes to confirm publication. The icing on the cake is that our operating costs are significantly lower than what they were under our old provider. It’s rare that everyone wins in a technology transition, but that’s exactly what’s been accomplished in our move to Google App Engine. With a better customer experience, lower operating costs, and fewer technological headaches, we only wish that we’d made the switch sooner. Editor's note: Today’s guest blogger is Steve Weston, Group Technology Director at Hays Recruitment, which is a leading global expert in qualified, professional and skilled recruitment. Hays is an international recruitment agency with 7,800 staff in 245 offices across 33 countries, and has recently expanded into Chile, Colombia and Malaysia. See what other organizations that use the Google Search Appliance have to say. The recruitment industry is incredibly competitive. Often we win business when our recruitment consultants are able to get the best CVs to our clients faster than our competitors. We rely heavily on our contact databases so that we can match the best candidates to job vacancies. At Hays, we have over 20 million archived documents and we receive 30,000 new CVs a day. With our old search system, CVs had to be categorised into databases and manually tagged. This held up the process of them entering the system, so our consultants couldn’t access them straight away. Consultants also had to learn specific codes to return the results they wanted, which made the whole process very time consuming. To fix this problem we chose to implement the Google Search Appliance 7.0 (GSA). Not only does it integrate seamlessly with our internal database, but it also automatically indexes CVs. This means that our recruitment consultants have access to the most up to date candidates at all times and our IT team no longer has to spend hours manually indexing information. Since adopting GSA, our IT team have reduced the time they spend on search by 90%. Our recruitment consultants have also become more efficient because they're able to search across multiple databases in a second's time. Since the GSA is intuitive for a young workforce that is used to seamless consumer search, we also now save hours and thousands of pounds in training every year. GSA 7.0 gives us the ability to automatically translate CVs and job specs through Google Translate. It is easier for us to compete in global markets, finding the best candidates within a global talent pool who may have previously been missed in the sea of information. For example, roles within the oil and gas industry are typically scattered around the world so it's far easier for us to match relevant candidates now that we have access to the Translate tool. The global search capabilities of the GSA have also led to a cultural shift. Whereas previously there was a tendency to hoard the best candidates within specific databases, which only select recruitment consultants would be searching, now the candidate database is completely open so no single recruitment agent ‘owns’ the candidates within it. These benefits have meant we’re now looking to use the GSA across all of our websites globally, making it easier and quicker for job seekers to find the right roles. After rolling this out in the UK and Ireland we found bounce rates have been dramatically reduced, meaning more people are finding the jobs they need from the site. Google Enterprise’s search technology has fundamentally improved our business. It has put us firmly ahead of our competitors, making us more profitable and allowing us to expand internationally into new markets. Editor's note: Our guest blogger is Adam Varga, lead engineer at Datalot, an online customer acquisition platform. See what other organizations that have gone Google have to say. Customers like hearing a human voice on the other end of the phone line, not a distant, automated recording. At Datalot, we provide cloud-based call centers so that our client's potential customers always encounter a real person when they have a question, need help and make a phone call. We help companies in all lines of business, from health insurance to home improvement, find and connect with their customers because person-to-person interactions are a key ingredient in customer acquisition. We built our first call centers using Windows computers, but that setup created headaches. I constantly had to adjust settings, restart machines or delete drivers that slowed down the call center computers. I felt like I was spending all my time troubleshooting Windows when I really wanted to focus on developing the software that would make our call centers more efficient. I needed to find a new approach. Chromebooks were just the ticket. They’re simple for us to set up from anywhere and easy for call center agents to use. The Chrome management console allows for no touch deployment. It lets us lock down user permissions, set up the agent login page as a default homepage, monitor usage, and set the apps and extensions we want our agents to use. Standardizing on a single browser, Chrome, which powers Chromebooks also eliminates any app/browser compatibility surprises. IT doesn’t need to worry about major problems slowing us down. Google ships the machines to the call center location and we set them up from our Brooklyn headquarters. It takes us very little time to establish a working call center anywhere. The frequency and quality of Chrome OS updates also make it easy for us to focus on our clients, not our hardware. It’s especially crucial that these OS updates are sent to our machines automatically, so I don’t have to dial up the call center and tell agents to click the “update” button myself. We’ve just touched the surface of what’s possible with Chromebooks. In the near future, we’ll leverage the User Management API to provide single sign-on for our agents and we hope to power entire call centers using only a Chrome extension. Chromebooks let us get our call centers up-and-running fast, so we know the human element that’s so important to our business isn’t getting lost because of IT issues. We can focus on building out our services and growing the company, and let Chromebooks handle the rest.